Package Instructions: In a large mixing bowl or electric mixer, combine Mam Papauls Bread Pudding mix with 3 cups milk, 6 tbsp. melted butter/margarine, and 2 large eggs. Fold in 8 ounces (about 7 to 8 cups) of cubed fresh or stale bread pieces. Mixture should be moist but not soupy. Bake in coated 8x8x2 baking dish at 350 degrees for about 1 hr to 1 hour 15 minutes, until nicely browned on top. 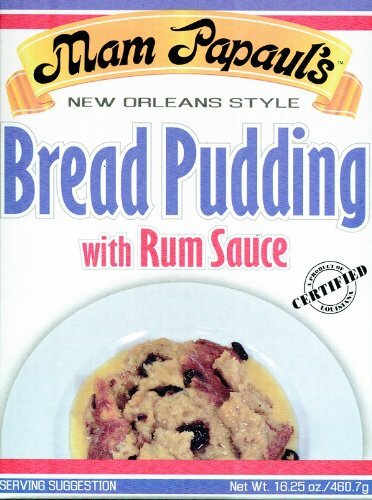 While bread pudding is baking, prepare rum sauce by mixing Mam Papaul's Rum Sauce mix with 6 tbsp. of butter/margarine and 1/3 cup milk. Bring mixture to boil, reduce heat and simmer for 5 minutes. Serve over warm bread pudding. If you have any questions about this product by Mam Papaul, contact us by completing and submitting the form below. If you are looking for a specif part number, please include it with your message.